Every July, while all of New York City is in the throes of summer revelry, I make my way to Holy Cross Monastery to participate in Summer Contemplative Days. I am one of only fifteen guests who spend four days at the Monastery in almost complete silence. Sitting solidly on the west bank of the majestic Hudson River, Holy Cross Monastery is one of four monastic communities within the Order of the Holy Cross, a Benedictine order in the Episcopal Church, USA. The monks follow two rules: those of the Monastery’s founder James Huntington, and the Rule of St. Benedict, which holds hospitality as a cornerstone. Almost five thousand souls per year seek the peace and reverent stillness that envelop the beautiful setting. 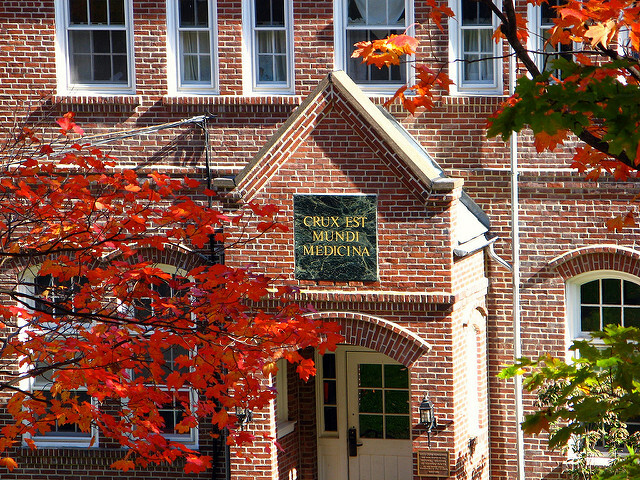 Entering through the Guesthouse door, all visitors pass beneath the dark-green granite plaque inscribed in gold with the words “Crux Est Mundi Medicina” – “The Cross Is the World’s Medicine.” I am both comforted and chastened whenever I look up at those words, a reminder of what is the best cure against the world’s innumerable maladies. Guestrooms are immaculately clean and monastically simple. A plain wooden crucifix, neither too large to overwhelm, nor too small to be ignored, is affixed to a wall. Each room (locked only by a slender bolt) is named for a Christian saint. This year my room looked out on the shimmering Hudson River and the Palisades. I welcome the absence of a telephone, radio, and television, but the large variety of books, newspapers and magazines throughout the Guesthouse makes it impossible to be completely disconnected from the world. When I arrived a little after two o’clock in the afternoon, the Monastery and Guesthouse were already swathed in deep silence. Stepping over the threshold is always a move from one kind of existence into another, not unlike a scene in Jean Cocteau’s film La belle et la bête (Beauty and the Beast), where Belle leaves her workaday life and enters the Beast’s enchanted and soundless realm. Once settled in, I adjusted myself to the Monastery’s sacred timetable, where the day begins with Matins at 7:00 a.m. and concludes with Vespers at 5:00 p.m. I abandoned my watch, as the tolling bell summons monks and guests to prayer in the Monastery’s church. The offices (daily prayers) at Holy Cross are formal, timeless, and deeply intentional. Otherwise clad in jeans and comfortable shirts, the monks are vested in white robes and sit solemnly in their stalls, resembling a page from an illuminated manuscript. I sometimes lost my way in the breviary (prayer book), and was usually a note too high or too low during the plainsong chanting, yet I was thoroughly engaged in what was taking place around and within me during those services. The exchange of the peace, rather than a polite handshake, was a hug-fest lasting several minutes. When we gathered at the heavy wood altar to receive the consecrated bread and wine, time seemed suspended: all distinctions that separate us were erased in this central and sacred moment. The silence also extends to mealtimes, which, even for the experienced, can be one of the more challenging parts of a retreat. I have learned to be attentive to the myriad sounds that emerge from the silence in the refectory: the clink of cutlery on plates, the drag of chairs on the floor, the clearing of throats. I eat more mindfully and thankfully, and discover that having a meal can be another form of prayer. I do not go on retreat to escape to an enchanted realm. I go to find a “thin place,” where holiness is present and shares space with humanity, despite its (and my) brokenness. In retreat, I am able to simply be, rest, and to reflect on what God is showing forth in my life. Within that silence, I find not only peace, but also truth. Have you ever been on a retreat? Where and why? Wonderful! I’ve not yet been to Holy Cross, but I’ve done three week-long retreats at the Abbey of Gethsemani in Kentucky. Reading your reflection today reminds me that I am long overdue for another retreat. Thank you for sharing this experience with us! Thank you very much for your kind comment. I have heard about the Abbey of Gethsemani and its wonderful retreats. 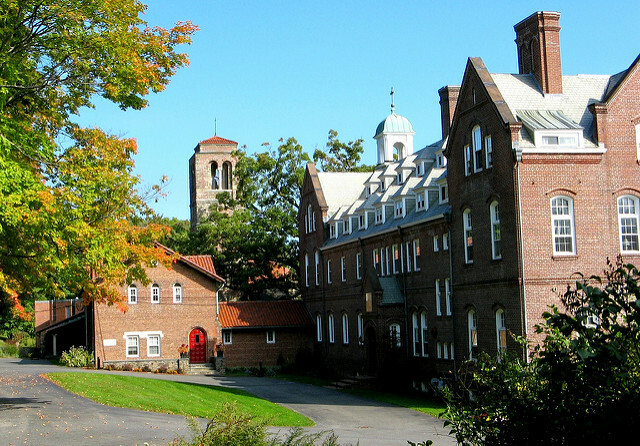 If you ever find yourself in New York and can make it to the Hudson Valley, perhaps you will be able to add Holy Cross to your retreat experiences. Thank you, Pamela. I am glad that you find rest and re-creation in retreats at our monastery. Blessings, We look forward to welcoming you again soon. Thank you for your comment. I am so moved to know that my essay brought back good thoughts about Holy Cross. I hope that it will be possible for you and your husband to arrange a return visit to that beautiful and holy place.